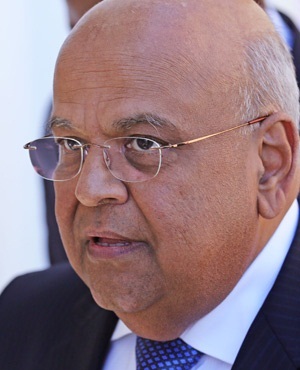 Cape Town - Finance Minister Pravin Gordhan has a list of 27 questions to answer by Wednesday March 2, relating to the so-called rogue South African Revenue Service (Sars) unit that was formed while he was heading the organisation. The letter was sent to Gordhan by Hawks boss Lieutenant General Berning Ntlemeza just days before the budget speech address. 1 Does the minister have any knowledge of the disbandment of the National Research Group (NRG) in 2009 when you were the Sars commissioner, leading to the establishment of the High Risk Investigation Unit (HRIU) or the “rogue unit”? 2 Were there any inputs you gave for the establishment of the NRG or the HRIU? 3 Who were the stakeholders who would form part of the new unit? 4 Do you still remember yourself as the commissioner of Sars recommending the funding model to the then minister Trevor Manuel in February 2007 for “funding of an intelligence capability within National Intelligence Agency (NIA) in support of Sars”? 5 How were the members of the unit recruited/selected? Were Sars recruitment processes followed? 6 How is it possible that you recruit even before funding approval is granted for such a capability to exist? 7 Kindly share with us or provide a copy of the agreement between the NIA and Sars. 8 What were the aims and objectives [mandate] of the new unit and subsequent operating environments as it changed its name? 9 Who was heading the unit and who was it responsible and accountable to? 10 Who were Janse van Rensburg, Johan de Waal, Johan van Loggerenberg and Helgard Lombard at Sars, and what were their positions, roles and responsibilities within the unit? 11 As the commissioner [accounting officer] for Sars at the time, were you briefed about all key strategic operations? 11.1 Do you know anything about operation code named “Sunday Evenings”? The bugging or installation of sophisticated surveillance equipment at National Prosecuting Authority offices? 11.2 Who authorised it? Is this in line with Sars’ mandate? 11.3 What were its objective and targets? 12Do you know or still remember the HRIU mandate? 13 Did the minister of intelligence [Ronnie Kasrils] approve the establishment of and identify members of the NIA to work within HRIU? Provide evidence. 14 Were there things at Sars [when you were the commissioner] that would have happened without your knowledge? 15 Did members of HRIU appear on the Sars normal employees’ payroll? Please explain why some, if not all, unit members had two Sars identification cards [one with fake employee details]. 16 If this unit was operating legitimately, why were they operating from guesthouses, hotels, restaurants and their private dwellings? Further, why were they not provided with Sars laptops to store confidential information? 17 How was the funding of the unit’s operations managed? Which cost centres were employed? 18 Who was the head of the unit and who was it reporting to? 19 Were there any members of HRIU who did not have personal files at Sars? Can you tell us why, if any? 20 Who authorised the procurement of the surveillance equipment to be utilised during the unit’s operations? 21 What were Ivan Pillay’s functions at Sars from the period he started working until he retired? The functions must also include the period he was rehired after submitting an early retirement from Sars. And what are his academic qualifications? 22 Do you still remember which year Ivan Pillay took an early retirement? 23 Is it normal in terms of Treasury or pension fund regulations for any department to accept its employee’s early retirement? 24 Why did you authorise that Sars must pay Ivan Pillay an early retirement penalty to the tune of R1.2 million? 25 Kindly explain why Sars re-employed Ivan Pillay for three years and then extended his contract to five years. In short, he was offered an additional eight-year employment contract – why? 26 We believe you are aware of the KPMG forensic investigations into the existence of a rogue unit at Sars. Do you perhaps have a clue as to why such an investigation is conducted? 27 Did the minister of finance receive the KPMG report? If yes, have you read it since you took office, or did you request to be briefed about its contents by the deputy minister or the commissioner? Have you made any contact with Judge Kroon, the chair of Sars’ advisory board on this matter, who is supposed to advise both yourself and the commissioner? Gordhan has been given until Wednesday to deliver, by hand, his responses to the Hawks’ offices in Pretoria.